The "Beach Comber" holiday accommodation features a 3 bedroom, 1 bathroom comfortable, sunny home (north facing) with lovely views out to the harbour mouth. This holiday home has been retro double glazed, heatpump, Sky TV, DVD player and free wifi, a covered deck bbq. There is also a separate games room with a pool table (mini size great for the kids), table tennis table top and LCD TV with chromecast and nintendo wii games console. There is easy direct access at the front of the section to get to the beach only 50m away. This particular part of the beach is highly sought after regarding surfcasting and wind kiting. A scenic 20 min flat walk along the beach (or 5 min drive) to Raglan's township of cafes and shops or an easy 10 min stroll down the road to "Rock-It" cafe, known for great breakfasts, coffee and outdoor area. The Harbour beach directly out front of the bach is well known for seeing Orca whales when they visit the harbour several times a year. If you walk south to Ngaranui Surf Beach you can swim safely between the lifeguard patrolled area from Labour - Easter weekend. Open plan kitchen/living/lounge area opening out through ranchslider to covered deck/bbq area with outdoor dining table. The master bedroom also boasts its own ranchslider (amazing view from bed) onto a small deck and has a comfy super king bed. Bedroom #2 has a double bed with #3 bedroom consisting of bunk bed (double on the bottom with single up top), ideal for children! All rooms have built-in wardrobes. Main bathroom is good size with shower, toilet and large vanity plus a separate 2nd shower in laundry area. Please note linen supplied is optional at $18/person/stay. This includes full bedding, towels, face cloths, hand towels, bath mats, tea towels and complimentary soap. * 5 night minimum booking over Xmas/New year period. Linen; (optional) NZ$18.00 per person/stay, please enquire with property manager for correct quotation. Hi, my name is Jull's Klenner and I manager BEACH COMBER holiday accommodation on behalf of owners. If you would like to find out more about myself, my business please visit my website: www.raglanholidayproperties.co.nz Thank you. Comfortable, well appointed, clean with a large flat lawn and games room, ideal family accommodation. Full toilet, shower and basin in main bathroom with another shower located in laundry room. Heatpump in main living area plus heaters in 2 of the bedrooms. Very warm north facing home. Linen - $18/person (optional). Linen consists of full bedding, towels, face cloths, hand towels, bath mats and tea towels. Please note no beach towels are provided. We have supplied 2 airers to dry clothes. We supply coffee, tea, sugar, salt and pepper. Can accommodate 6 at dining table. Child's highchair available upon request. Separate games room with a pool table (mini size great for the kids), table tennis table top and LCD TV with chromecast and nintendo wii games console. An assortment of children games to choose from. Mini pool table for the kids. Ping Pong table which sits on top of mini pool table. LCD TV with chromecast and nintendo wii games console. Plenty of space for the children to run around. Small balcony off main bedroom. Bring your own or hire locally. Plenty of space to park the boat. Can be closed in if raining. Public tennis courts are located next to the Raglan Rugby Club in Cross St.
Raglan Golf Club; Te Hutewai Road, Raglan. 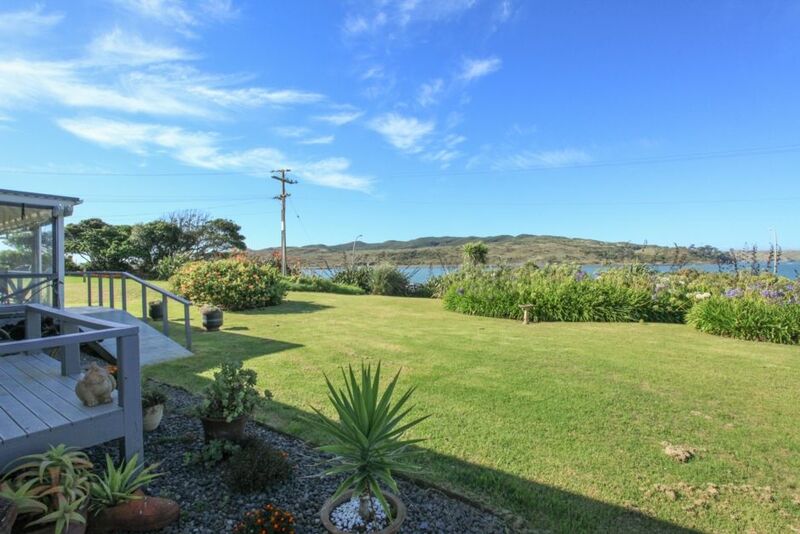 Great location, beautiful view, swimming, kayaking, beach walks, body boarding, bike riding all from door step or close by. Lots of space in garden, outdoor seating, books, play space. Thank you!! Wonderfully peaceful place to stay. Easy access to the beach. The home is roomy and comfortable. Added games room was a bonus. The outside decking created another room which was used a lot. We would definitely book this house again. We loved our 5 night stay at the cottage. It is basic in appearance but has a picture perfect view, beautiful lawn and garden and extremely comfortable beds. It had all the facilities to eat at home and the laundry was a bonus for travellers. Best of all was the position - it’s out of town so it’s quiet and private, but close to the surfing beaches and a 5 minute drive to town for any meals and coffee. The manager was great to communicate with. Wish we could stay for a month! We had a lovely family weekend away. The house is really comfortable, has everything you need (& a very well equipped kitchen) and is a great size. We enjoyed sitting on the deck looking out across the estuary and the games room was an added bonus for the boys with us. It was only a short drive to the surf beaches or into town. We can’t wait to return again over summer! We were very impessed with Beach Comber bach. Facilities were great,comfortable beds and overall the bach was very clean and well presented. We would certainly recommend the place to friends & family. We enjoyed our time in Raglan a great experience with everyone so friendly. Great spot, lovely house, perfect for families with young children! Thank you, an absolute pleasure accommodating you and your family. Easy access to beach via front of section, across the road and you are there!